Lesson #1 was about which end of the camera the light goes in and where it goes once it's inside. Lesson #2 was about using a camera's shooting modes to CONTROL aperture or shutterspeed.... or nothing ... or everything. Lesson #3 was about making your photographs have IMPACT by using good composition. Remember that there were three important parameters that needed to be chosen for each photograph in order to get a good exposure: ISO, aperture, and shutterspeed. In this lesson, I'm going to show you the tradeoffs that are associated with ISO. 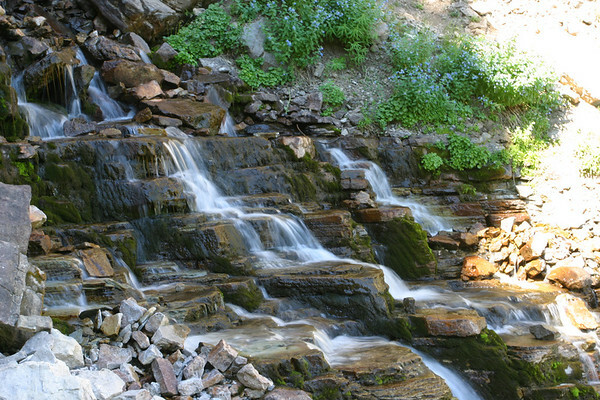 I'll start with a brief description, then I'll show some examples of photographs that illustrate the tradeoffs. You'll see how these tradeoffs happen in REAL LIFE! Remember that ISO is all about the sensitivity of your sensor - or film, if you've not yet made the switch. An ISO setting of 100 is half as sensitive to light as an ISO setting of 200. Likewise, 400 is twice as sensitive as 200, and 800 is twice as sensitive as 400. Some cameras go all the way up to 3200 and 6400 ISO. The higher the ISO number, the more sensitive it is to light. So when do you need your sensor to be more sensitive to light? There are two answers: (a) when there's NOT much light and (b) when you don't want to use much of the light that is available. Lowlight situations like during a church service are an example of the first. 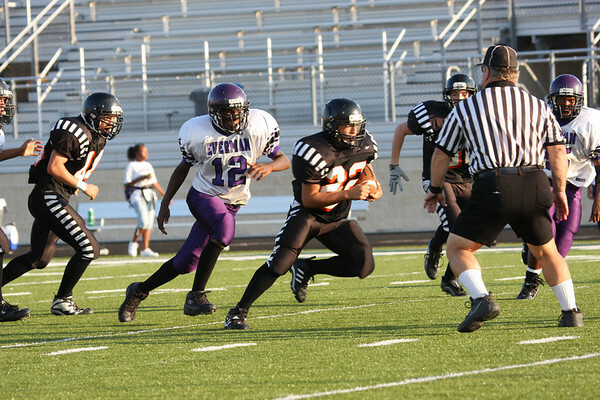 Sports photography when you want to stop the action with a super fast shutterspeed is an example of the second. Indoor sports photography inside poorly lit gymnasiums is a double-whammy. In that case there's not much light available AND you want a fast shutterspeed to stop the action. That's when you'll have to crank the ISO up as high as it will go. So what is the tradeoff? Why not shoot at a high ISO all the time? Because of digital noise. Back in the old days with film, the higher the ISO - the grainier the photograph would be. With digital, we have the same problem. High ISO leads to more digital noise. The good news, however, is that in the last few years the camera companies have gotten very good at managing digital noise. The Canon 40D camera that I use now gives me photos at 3200 ISO that have about the same amount of digital noise as my old Canon Digital Rebel had at 800 ISO. That's a huge difference! Yay Technology! Tradeoff #1 - ISO - Higher ISO lets you shoot faster shutterspeeds and with less light but it may result in more digital noise. This first shot is of a young lady playing guitar in a very low-light situation where I had to shoot at 1/100th of a second (fast enough to keep her moving hand from being blurred) with the lens aperture at f/2.8 (wide open) and with the ISO set to 1600 (as high as it would go on that camera.) The result is a very nice photo when you look at it this size. But if you were to enlarge it very much, you can begin to see the GRAININESS in the photo. That's digital noise. Another pair of examples: Different young lady, ISO at 100 (1/16th as sensitive as ISO 1600) in a brighter setting. Enlarge just her face and..... very little GRAININESS ..... very little digital noise. Now, did I say GRAININESS is bad? No way! There are times when digital noise can add a certain artistic look to a photograph. You also must keep in mind whether or not the photograph will be enlarged. I shoot lots of sports photos at high ISO that would make very grainy posters. But most of my customers buy 4x6 prints! Graininess and digital noise are much less important on the smaller uncropped prints. My point is NOT to teach you to avoid digital noise or graininess but to KNOW when to expect it and decide for yourself if it's okay in each situation. 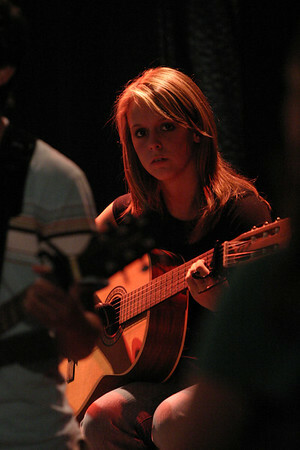 I personally like the first photo of the young lady playing guitar and I think the digital noise doesn't hurt at all. Why? Because it gives the photo IMPACT and that is something we learned to work toward in our last lesson. A grainy photo taken in a coffeehouse setting under the warm glow of stage lights: very cool! Now that you understand ISO, you know what to expect when you change it. It's a tool in your camera bag that you can begin to use effectively. Go shoot some photos. Mess with the ISO settings on your camera and watch what happens to your photos. Good Luck! Today was pretty slow..... until about 4:45pm and that's when our dinner guests arrived! This guy was checking us out through the window of the condo. 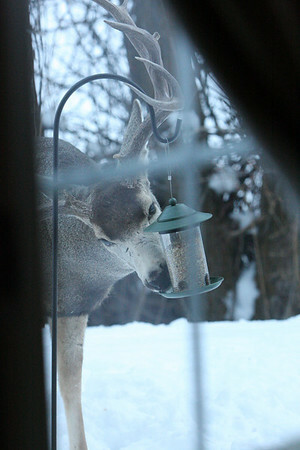 It turns out that bird feeders aren't just for birds anymore. 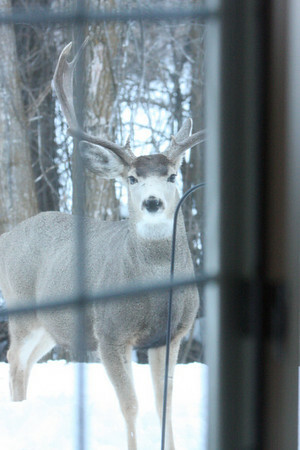 Jill was concerned this morning about why her bird feeder had been emptied in one night. Now we know. 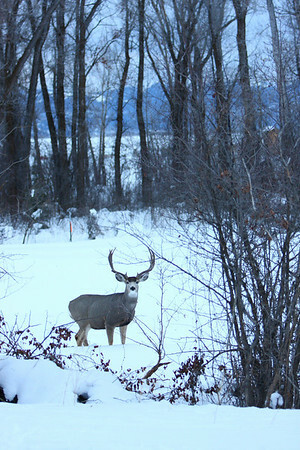 I slipped out the front door and discovered that our dinner guest had not come "stag" but had brought a younger friend. 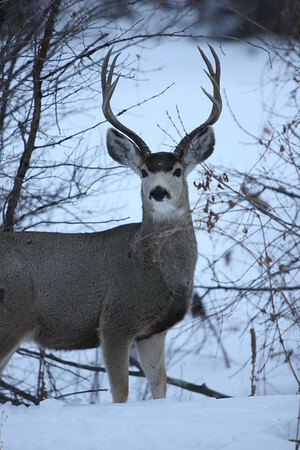 I was able to get good shots of both of them before they wandered back across Teton Creek. 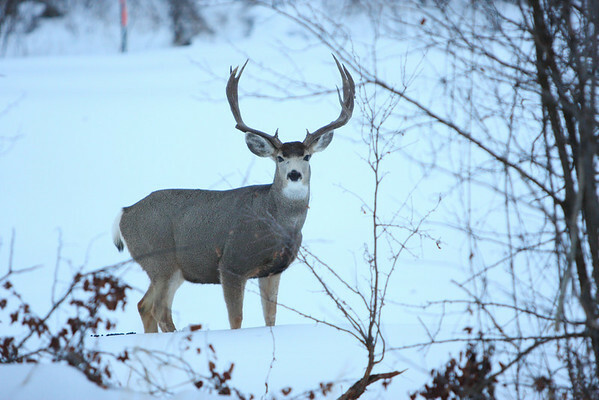 FOR THE RECORD: I've hunted muledeer with great success in eight of the last nine years but I've never taken one as large as this big boy. Even with a major fork of his right antler broken, he's a trophy. I'm just as proud to get photos of him. I'm glad you like some of the photos I've taken but what really matters to me is that I like them. I shoot for ME FIRST! I've entered a few photo contests with some of my absolute favorite shots and I've come away disappointed. I've posted my favorites on internet photography forums and I've had people tell me why they didn't like my best work. Please understand - I'm not afraid of criticism but I do recognize that opinions are like bellybuttons...... everyone has one: some stick out and some are full of lint. 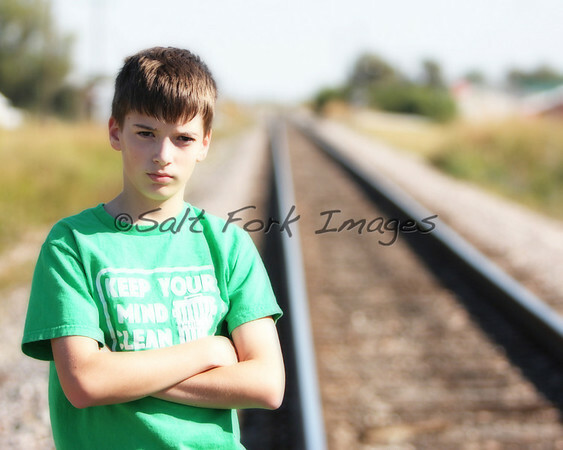 Our goal is to get you making photos that YOU like. I can tell you what I like about a photo and I can give you some ideas about what makes a photo compelling to ME, but the big question for YOU should be whether or not YOU like it. With all that in mind, many of you have told me that you are disappointed with the photographs that you get and that you wish you could make shots like I make. You should probably know that I get lots of disappointing photographs too. I'm shooting at a rate of 40,000 shots per year these days. LOTS of those shots aren't very good. Many are downright disappointing. The trick for me, however, is that I usually know what to do when I get a lousy photo. I know how to adjust the camera - on the spot - to salvage the moment. That's what Lessons 1 and 2 were all about. Learn to use the camera so that when you are standing in front of that beautiful mountainside..... you can get it...... on the second or third try, at least. TRANSLATION: Digital media is cheap. Shoot lots of photos. Learn to look at the display on the back of your camera and learn to ADJUST your shooting based on what you see. END OF TRANSLATION! Now let's talk about COMPOSITION. What makes great photographic composition? Is it a great subject? Or, is it something more subtle? I believe it is possible to make great photographs with lousy subjects and lousy photographs with great subjects. So what makes the difference? Good photographs have EMOTIONAL IMPACT. If its a shot of your kid or your dog or your aging grandmother, it's easy to understand the emotional impact. But what about a landscape photograph. 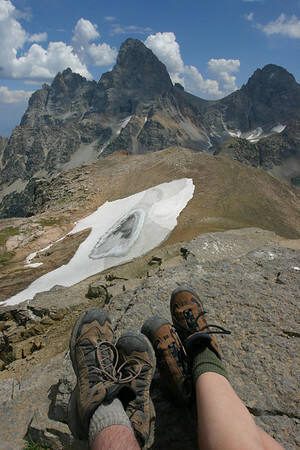 How can a beautiful mountain photograph have emotional impact? Simple: It has to make the viewer feel like he is there instead of just looking at a pretty picture. How can a photograph make you feel like you are there? We'll get there with three simple concepts: Arrangement, Perspective, and, uh..... Arrangement, again.... This should be fun! For me, a photograph should draw the eye of the viewer into the frame. The most compelling photographs make the viewer feel as though he is part of the scene. Most postcards appeal to us because they remind us of BEING THERE. Of course they are perfectly exposed and the color is captured during the best light of the day, but what really makes them work is that they draw us into the scene and stimulate the emotions that we felt when we were actually there. The lines and elements of a photograph can draw us in ...... or bore us completely. Let me tell you what I have seen over and over again. As many of you know, I love Jackson Hole, Wyoming. In fact, I was there TODAY. I'm writing this after spending part of my afternoon in what I consider to be one of the most beautiful places in the whole wide world! I always chuckle as I drive up the main highway because I see people pulled off in the National Park Service pullouts photographing the spectacular Teton Range. The mountains along this drive are unbelievable. 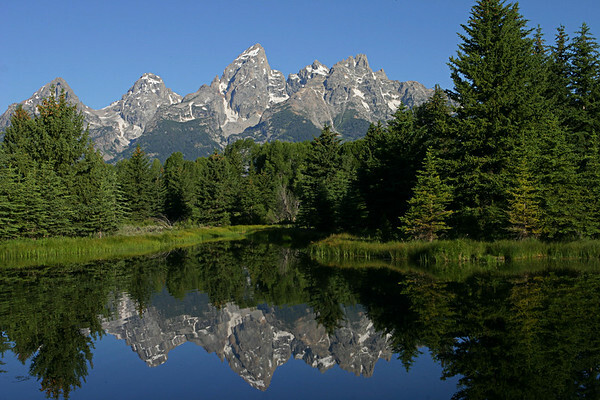 If you've never been to Grand Teton National Park, you should put it on your list. If you don't have a list..... start one and put GTNP at the top. It's a must-see. Anyway, I see these folks snapping photos from the highway and I'm sad for them because I know they are going to be disappointed with their photographs BECAUSE THEY ARE FLAT! They'll say things like, "well, those mountains are unbelievable.... my pictures just don't do them justice." The problem is that there is nothing to DRAW the viewer into the photograph. This shot works because the viewer is drawn into the photo by the foreground and middle ground. 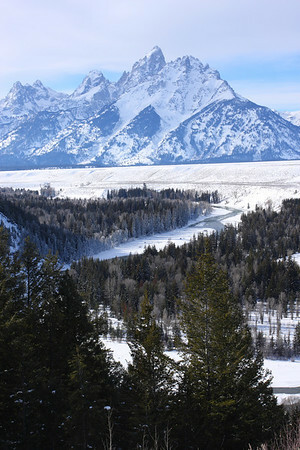 Grand Teton, the 13,770-foot mountain in the background, anchors the scene but its the foreground of the trees and the middle ground of the river that make it work so well. Without the foreground and middle elements, this would just be a FLAT photo of the side of some really pretty mountains. Granted, you would have recorded what was there if you just shot the mountains with no foreground elements. But if you really want that POSTCARD feel, draw the viewer into the photograph by including foreground and - if possible - middle ground elements. This shot works because of BEAVERS! Beavers built a dam on this little backwater of the Snake River causing the water to backup into a nice pool that creates a perfect reflection of the mountains. You get foreground with the reflection, middle ground with the trees on the back of the pond, and the Teton Range anchoring the background. The elements of this photograph work together to draw you into the frame. It almost feels like you are there! 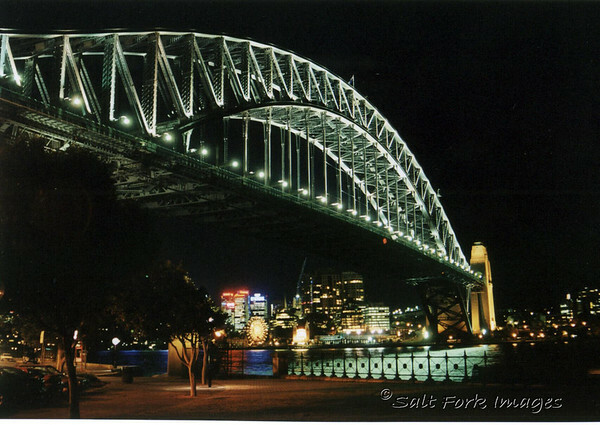 This is the Sydney Harbor Bridge in Sydney, Australia. I took this shot back in 2000 using film.... and I got very lucky! Everyone notices the spectacular bridge leading your eye across the harbor, but did you notice the railing in the FOREGROUND? 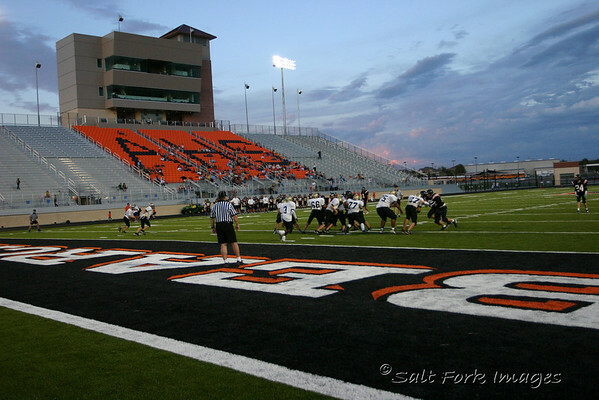 This is the west endzone at the Aledo High School Stadium. See how the endzone lines draw you into the photo from the foreground and notice how your eyes follow the lines into the frame and end on the impressive home bleachers. Because I'm not facing the home bleachers straight-on, the line of the seating leads away on another diagonal. It doesn't hurt that the sky behind the bleachers is interesting as well! Imagine how boring this would look if I just shot straight across at the home bleachers. 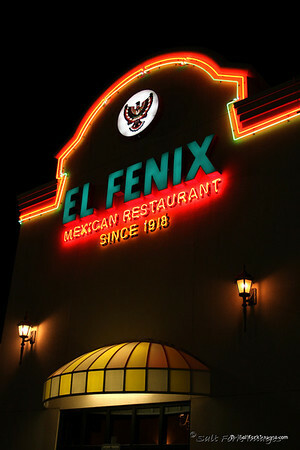 Another example: Anyone hungry for TexMex? Maybe you are shooting something that doesn't allow any neat perspective and it doesn't afford the luxury of strong foreground elements.....what do you do then? There is something called, "The Rule of Thirds," that you need to know about and you need to be prepared to break it whenever you feel like it. The Rule of Thirds says that you should arrange the elements in a photograph so that they are not centered left to right or top to bottom. The most "pleasing" arrangement is for the elements of the photograph to be located one-third of the way across the frame and one-third of the way up or down in the frame. TRANSLATION: Don't center your subjects. END TRANSLATION. Emotional Impact happens when you draw the viewer into the photograph. You want to make them FEEL like they are a part of it. You can do this by including foreground elements. You can draw them in using diagonal lines and different angles and perspectives. You can draw them in by arranging the elements in a pleasing way. This stuff works! When I look back at my best photos I recall exactly what it was like when I stood there. I want you to be able to feel the same thing when you look at your photos. You also need to understand that shooting photos this way - using these concepts - becomes a part of HOW YOU SEE. After a while you won't have to think about what you are doing. You will just find yourself drawn to the kind of scenes that work. You will even find yourself skipping the roadside pull-out in favor of something much greater. Take a look at the photos in my Personal Favorites Galleries. Try to notice all the different ways I use diagonals lines, foreground elements, and the rule-of-thirds in my shots. You might also notice how often I break the rule-of-thirds, too!